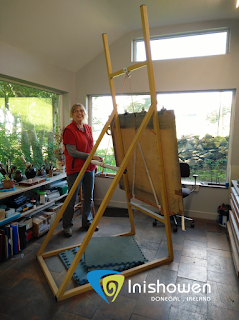 Today’s blog takes me to Ballagh Studio, in Ballagh, Inishowen to meet acclaimed artist and native of Malin, Ros Harvey. From the picturesque town of Malin, I follow a series of quirky signs entitled "paintings". The route itself brings the visitor on a scenic journey where on arrival a beautiful beach and rolling hills can be seen in the distance (see above). As I pull into a spacious drive there is a collection of traditional buildings that appear to have been lovingly restored. At the front door of the large ivy covered building I am welcomed by Ros Harvey, pictured above, who guides me to a showroom. The showroom, pictured below, originally a Cow Byre, has a warm and inviting feel. 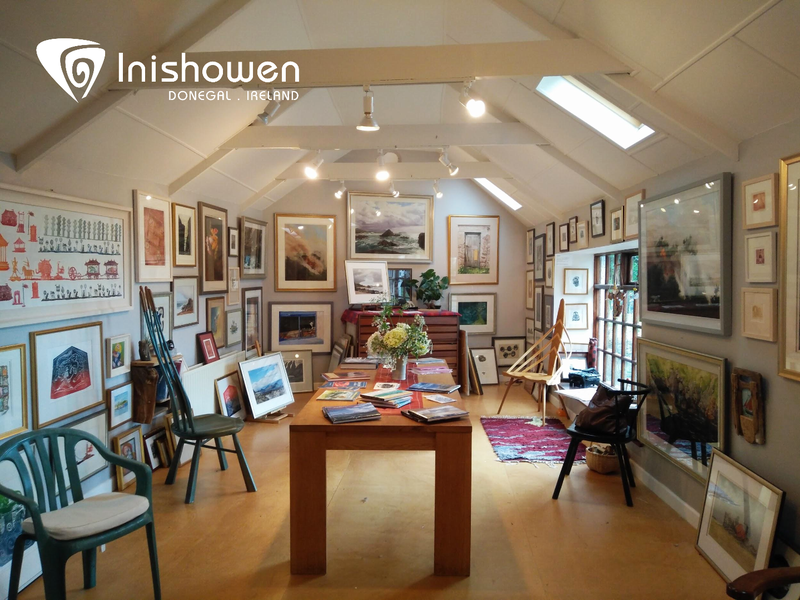 Each wall displays a collection of stunning paintings and prints. The room hints at a love of craft as well as art, amplified by the uniquely carved chairs. Books placed on the large table suggest a passion for myth and folklore, alongside a love of the sea and landscape. I later learnt that myth and folklore is largely a passion of Tim Stamptons. Tim, a printmaker and illustrator, met Ros in 1979 and in 1988 they established the Ballagh Studio. 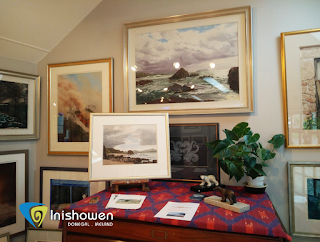 Dramatic seascapes and landscapes on display are inspired by the rugged and diverse landscape in Inishowen. 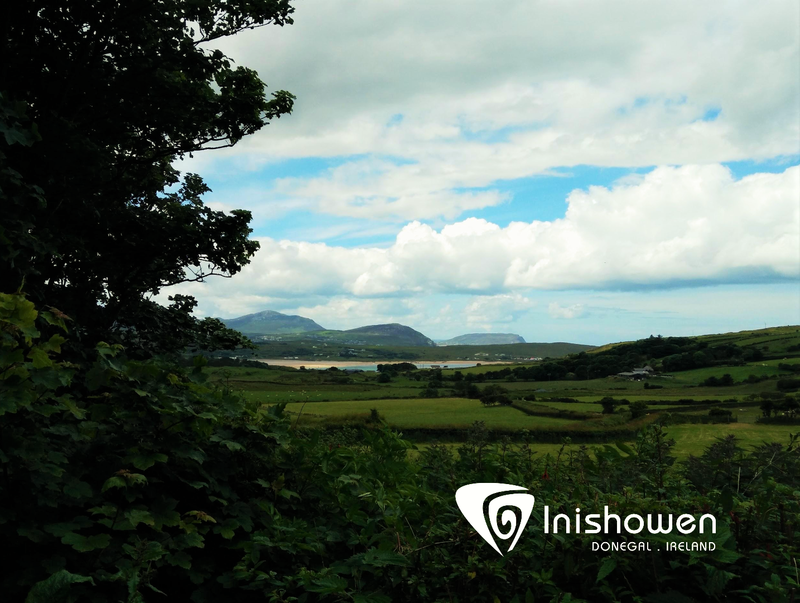 Many scenes capture Trawbeaga Bay, the Isle of Doagh and other iconic locations around the peninsula. Ros captures the power of the sea beautifully in her work. It is the “Rocks, boats and the sea (that) create a sense of deep home roots”. What Inspired an Interest in Art? From the age of 13 Ros had been around many great pieces of art. Her stepfather had an interest in both the subject and collection of abstract art. Despite the fact that Ros herself has practiced a very different artistic style, she believes this harbored an initial interest. Ros began her artistic career as a potter, spending many years producing pottery in Dublin, where she became one of the leading potters of original ash-glazed stoneware in the country. Following a decision to move from Dublin to England Ros met Tim Stampton, who, “at the time was making large pieces of garden pottery”. 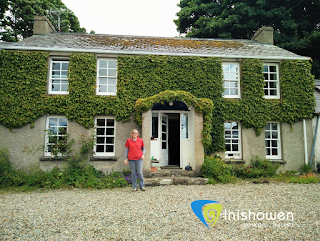 After a number of years in England selling pottery they made the decision to move back to Ireland and “With only 79 Punt in the bank and a little luck, they made their way along the Irish West coast” to find their new home. The “Closer we got to Inishowen the more excited we felt”. Having been away for 30 years, Ros now “felt at home”. In 1988 Ros & Tim purchased a Clachan, a small group of houses with a farmstead, outbuildings and a few family homes. Over the next 25 years they would carefully restore each building that had lain empty for over 17 years. 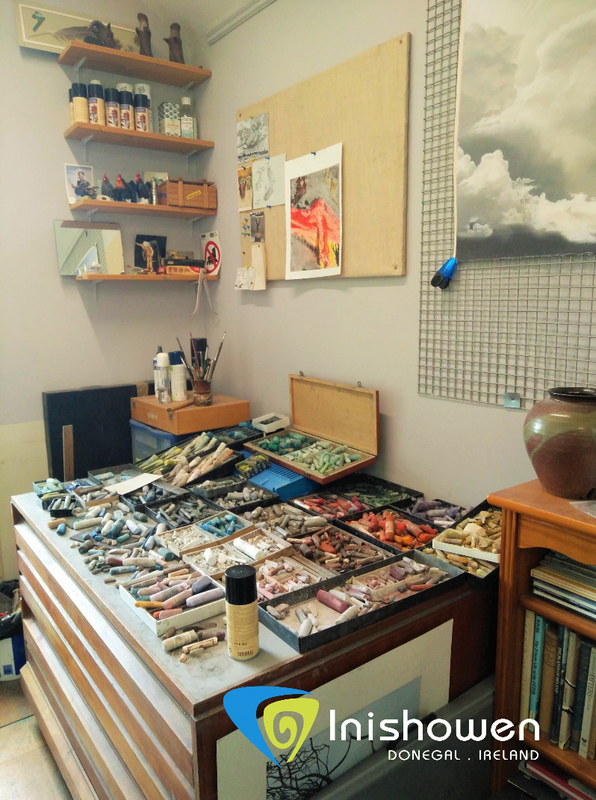 “Altogether we’ve got the house, two studios, framing shop, showroom and print workshop.” Ros describes the experience as “a labour of love”, using the profit from art sales to gradually restore the property. Shortly after moving in in 1990 they “sold their first painting off a trestle table in the gravel on their front yard”. Since then, Ros has exhibited in venues all over the world. To date, Ros is a Member of The Royal Ulster Academy and the Pastel Society of Ireland, has held major one-man exhibitions and illustrated a number of books. Following a back operation in 1981, Ross would begin a different creative journey. After a time experimenting with watercolor and oil based paints, it was by chance that she would find her preferred medium, pastel. “A friend had left a set of pastels behind…. the texture of pastel had a similar feel to clay which allowed for 3D imaging”. 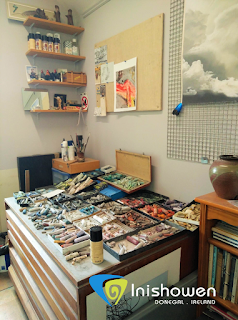 The move from ceramics to pastels was like “flipping the magic switch”. Pastels allowed Ros to capture form and focus in her paintings alongside a gorgeous depth of colour. Audiences engage in different ways with her work, “Many locals engage with and purchase paintings of local scenes”. From a quick look at the visitor guestbook it is clear that people from all over the world visit the studio, many of whom return. To the back of the property, surrounded by trees and lush green fields Ros has a studio located on what was originally a privy. The studio is dominated by windows in order to take advantage of natural light. It was “built by a local builder around a bay window we had salvaged”. What commands your attention as you enter is the large impressive easel built by a local blacksmith. The Ballagh Experience "The Closer we got to Inishowen the More Excited we Felt"
Visitors are also welcome to experience much more than the showroom, upon invitation you get the chance to visit Tim’s print workshop, pictured above, which contains a treasure trove of traditional print machines, wood cuts and wonderful illustrations. 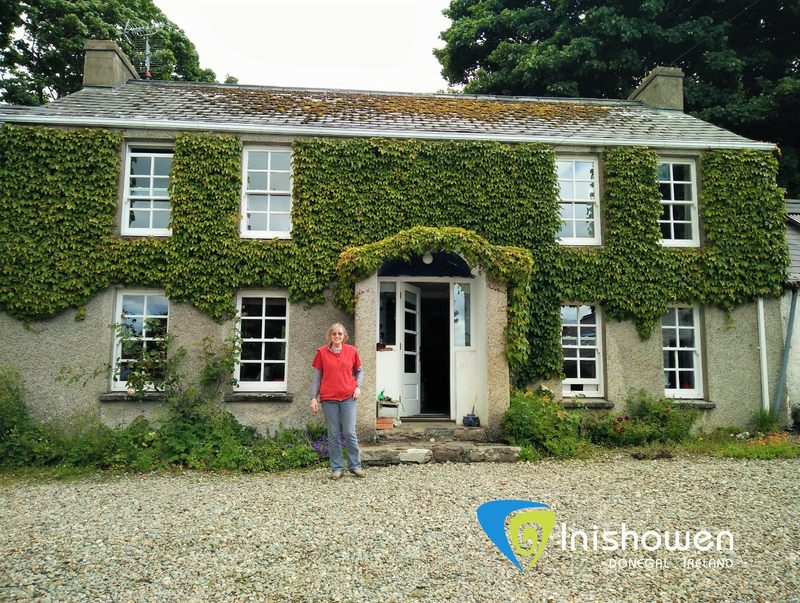 A visit to Ballagh Studio is a memorable experience, starting with the journey itself to this stunning location. There, you have the chance to meet and hear the fascinating story behind your purchase and of the artist who created it and lovingly restored the building in which it rests. Come see Ballagh Studio for Yourself! A selection of Ros’s work is available to purchase from Ballagh Studio and commissions are also taken. Open Mon-Sun 9-6. After hour visits are by appointment. 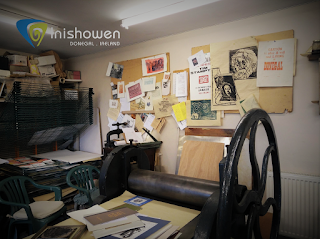 Add your comments below and make sure to stay tuned for part two of my Ballagh experience as I talk to Tim Stampton artist, print maker and illustrator in his workshop about all things print, folklore and myth.